Addresses the root cause of knee joint pain. This product addresses the root cause of knee joint pain in the knee, elbow, arm, hand and foot by . It transdermally delivers ingredients that the body uses normally to maintain proper joint cushioning. Deficiencies of these nutritional compounds are common in the elderly and can lead to bone degradation, inflammation and pain. Joint pain has many causes, from trauma to degenerative conditions such as arthritis or osteoarthritis, to infections. Arthritis joint pain is the most common cause of joint pain in older people. Doctors often recommend acetaminophen or nonsteroidal anti-inflammatory drugs to relieve some symptoms caused by arthritis, such as inflammation, swelling, stiffness, and joint pain. Such drugs treat arthritis symptoms but not the root cause. In osteoarthritis the joint pain is due to wear and tear of the cartilage and supporting tissues. If your doctor determines your symptoms and signs are due to degenerative disease such as osteoarthritis that root cause can be addressed with this product. ReJuviance Knee Joint Relief Cream is scientifically designed to deliver the correct blend of osteoarthritis joint supplement compounds by ReJuviance transdermal delivery. It also can be used on other near surface joints like fingers, wrist, elbow, and toes. A 2003 clinical study of 63 patients for eight weeks showed that treatment of chronic knee pain with the topical preparation of that study containing glucosamine and chondroitin was effective in relieving the pain from osteoarthritis of the knee and improvement was evident within four weeks. (Journal of Rheumatology 2003 Mar; 30(5): 523-8.) 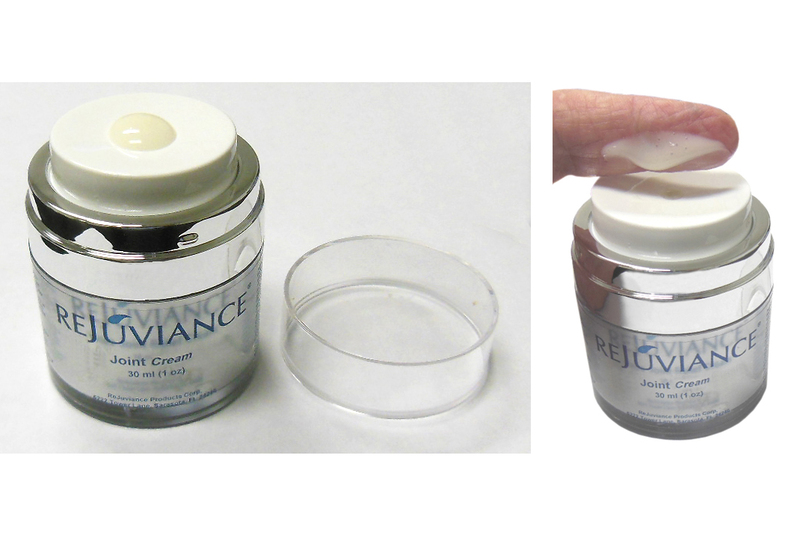 ReJuviance Knee Joint Relief Cream with novel transdermal delivery technology enhances rapid delivery of Glucosamine, Condroitin, and Methylsulfonylmethane. to the joints needing relief. This product contains nearly 20% concentration of those active herbal ingredients plus another 6.5% of transdermal enhancement ingredients to accelerate their delivery. I'm past 70 and still slow jogging 4 miles once a week. When I finish my knees are OK till they cool off but then get tight and weak later. If there's pain I like the topical joint pain relief product because its herbal, but find that the joint cushioning cream jar works even better for me. My "hot knees" seem to absorb the ingredients like a sponge. I think it brings back some impact cushioning. My joints are getting stiff and they aren't helped by taking the oral supplements, (some weeks they make it worse - don't know why). But delivery right to my knees through the skin helps without upsetting my stomach. Good product for my knees and it dries clear, quickly. (Slightly surface sticky dry so I were shorts when I use it. Can put more over dried layer next day. Remove clear cap and depress top to pump cream onto white surface. Scoop onto fingers and spread onto the joint areas needing relief. Leave on for at least 10 minutes. May reapply as needed. 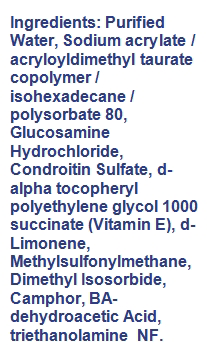 Purified Water, Sodium acrylate / acryloyldimethyl taurate copolymer / isohexadecane / polysorbate 80, Glucosamine Hydrochloride, d-alpha tocopheryl polyethylene glycol 1000 succinate (Vitamin E), Glycerin, Condroitin Sulfate, Dimethyl Isosorbide, Benzyl Alcohol, Methylsulfonylmethane, Fragrance, BA-dehydroacetic Acid, Triethanolamine NF. For external use only. If pain persists see a doctor. Keep out of eyes. Do not ingest. Safety of this product relies on the publicly available toxicological test data of its ingredients and of similar products. Glucosamine, an amino acid naturally produced in the body, is a precursor to a molecule used in the formation and repair of cartilage. Glucosamine has been shown for decades to be effective at easing the pain of arthritis and joint pain as well as helping rebuild cartilage. (Treatment is based on the idea that presence of the compound may increase the rate of formation of new cartilage by providing more of the necessary building blocks.) Chondroitin is the most abundant glycosaminoglycan in cartilage and is partly responsible for the resiliency of cartilage. Chondroitin is also important in preventing the action of the elastase enzyme released by white blood cells in inflamed joints that breaks down elastic fibers reducing the resiliency of cartilage. Scientists believe that the organosulfur compound Methylsulfonylmethane (MSM) also helps support health ligaments on the theory that the sulfur in it helps the body maintain healthy, flexible ligaments. Many older people begin taking oral joint supplements containing these supplements as they begin to encounter joint pain. Seniors with gastrointestinal complications are unable to tolerate oral joint supplement pills. Some use adhesive patches containing joint supplements, patches generally sold by chiropractors to patients who won’t or can’t take oral joint supplement pills. Joint patches must be removed and replaced daily, and there are predictable body hair complications with the adhesives.